Crypto market route from November continues to extend into the beginning of December. Many cryptocurrencies down > 90% Y/Y. Above: 97% of cryptos down over 90%. 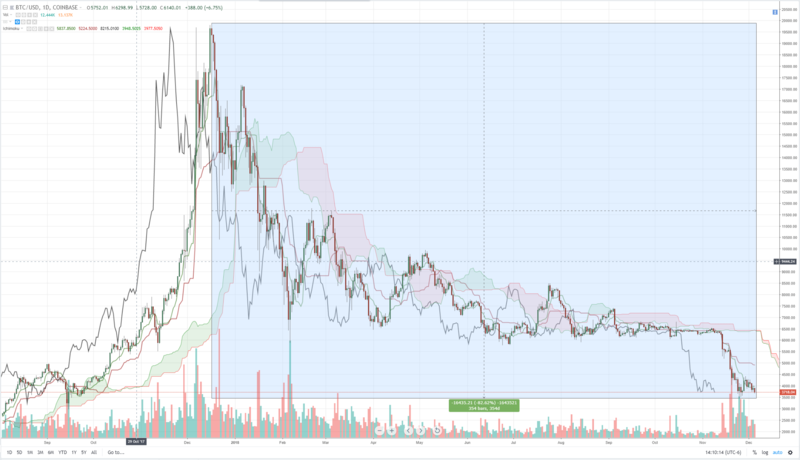 Bitcoin is continuing to face dramatic and powerful downside pressure, pressure that occurred in early November during a deep, deep drive lower for the entire market. New 2018 lows were printed for the entire month of November with every day seeming to create new lower lows. The current 2018 low rests at 3456.78 on November 25th. There was a brief relief rally from those lows between November 25th and November 29th where traders saw Bitcoin gain back nearly $1,000 in a four-day period – that represented a 27.72% move higher from the lows. However, prices have continued to sell off with a 7-day route that has seen Bitcoin drop -750 points to print a current December 5th intraday low of 3660, just above the 2018 low. If we take the all-time high made on December 17th, 2018 to the 2018 low on December 5th, 2018, we see a whopping -$16,435.21 dollar drop over 343 days – a -82.62% loss thus far for 2018. And we’re now less than 2-weeks from the yearly anniversary date of that all-time high. While the sell-off in the cryptocurrency market has impacted the retail trader, the significant discount appears to have drawn in significant institutional investment and ownership. During 2018 we’ve observed Coinbase, Bitgo and Gemini all become approved as regulated and authorized custodians for cryptocurrency. We’ve also seen the launch of the NYSE’s Bakkt cryptocurrency exchange. Even more important – but not reflected readily on charts, is the amount of volume traded in cryptos on OTC markets. OTC markets have grown considerably during 2018, with Coinbase’s OTC market just opening up a few weeks ago. It’s also hard to forget that futures contracts for Bitcoin released by CBOE and the CME are going to be almost a year old. The accumulation of cryptocurrencies during the entire 2018 route by institutions is very much contrary to how the retail investors and trader has been reacting to the market. Even the news cycles and pundits that have previously been bullish are no on the bearish side of this market, and a great many of Bitcoin’s detractors have voiced their opinion of the death of cryptocurrencies to be imminent. But if billions of cryptocurrencies are being accumulated by institutions, I’m going to follow their lead and not the panic of the masses.